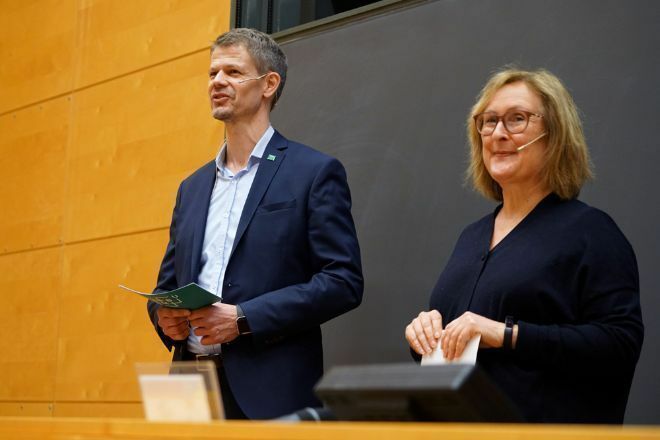 At this seminar PhD students, postdocs and Master´s students in life sciences at UiO and NMBU had the opportunity to create networks outside academia. Watch videos and see pictures from the event. The event was organized for the first time in 2018. The response was overwhelming and the 100 places were fully booked in a short time both in 2018 and 2019. 1:00 PM – 2:30 PM: An inspirational talk and short introductions from people working outside of academia who will tell how they are working and how they got there, see list of speakers below. 3:00 PM– 4:30 PM: A speed networking event where students have the opportunity to sit down and talk to companies, see list of companies below. An inspirational talk and short introductions from people working outside of academia on how they are working and how they got there. AstraZeneca is a multinational pharmaceutical and biopharmaceutical company. Cambridge, UK, is the headquarter. Mölndal near Gothenburg is one of three R&D sites. The focus for this site is research on traditional chemical drugs. Tine is Norway's largest producer, distributor and exporter of dairy products. Product leader for Omnipaque one of GE Healthcare's most widely used contrast agents used during imaging procedures for diagnostics. GE Healthcare is a manufacturer and distributor of diagnostic imaging agents and radiopharmaceuticals for imaging modalities that are used in medical imaging procedures. The Bellona Foundation is an independent non-profit organisation that aims to meet and fight the climate challenges, by identifying and implementing sustainable environmental solutions. Geno is the breeding organization of Norwegian Red, the main dairy breed in Norway. Geno distributes genetic material to more than 30 countries worldwide. IVF Fit has developed personalised hormone dosage for IVF treatment. Ana and Krister met at the School of Heath Innovation at the Faculty of Medicine at UiO. Their team is one of the projects in UiO:Life Science’s innovation programme SPARK Norway. Blueye robotics makes underwater drones. They want to make the beauty of the oceans, and the dangers they face, visible for everyone – everywhere. and former board member of UiO:Life Science. Speed networking where you have the opportunity to sit down and talk to companies. AbbVie, Astra Zeneca, Bayer, Bellona, Cancer Registry of Norway, GE Healthcare, Geno, Innovation Norway, Institute for Energy and Technology (Ife), Link Medical, Norwegian Agricultural Extension Service, Norwegian Veterinary Institute, Novartis, PCI Biotec, Pfizer, PubGene, REdu, ShareLab AS, Simula, The Life Science Consulting Group, The Norwegian Food Safety Authority, The Norwegian Institute for Nature Research (NINA), The Research Council of Norway, Thermo Fisher Scientific and Tine.